January | 2019 | A . T . T . N ! 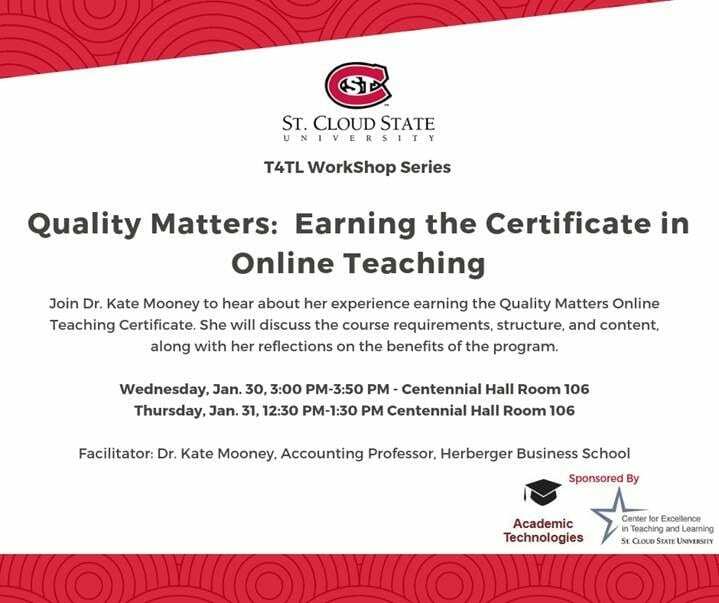 The Technology for Teaching and Learning (T4TL) Workshop series begins in January with Dr. Kate Mooney, Accounting Professor, Herberger Business School presenting on the Quality Matters Online Teaching Certification process. When / Where: Wednesday, January 30 from 3-3:50 pm in Centennial Hall 106 OR Thursday, January 31 from 12:30 – 1:30 pm in Centennial Hall 106. Description: This presentation will outline the requirements for earning the Online Teaching Certificate, a seven course program from Quality Matters. Dr. Kate Mooney earned the certificate as her sabbatical project and will share the course requirements, structure, and content, along with some reflections on the benefits of the program. If you cannot join us in Centennial Hall, please plan to attend online at https://webmeeting.minnstate.edu/t4tlworkshops.